Rockford Rain Art is BACK! This fun and interactive public art installation as part of the Rockford Area Convention & Visitors Bureau&apos;s Forest City Beautiful initiative is back again this year with additional locations and partners! The art is on display at 22 locations throughout the downtown River District, Midtown District, Swedish American Hospital campus and the Miracle Mile. Rockford Rain Art aims to bring a bit of joy to what might be a gloomy, rainy day. The art is visible only when the sidewalk is wet! So, if rain isn&apos;t in the forecast, grab a bottle of water and create your own rain! A fun way to explore the city with your friends and family! Download a map of this year&apos;s locations below. The art will be installed on sidewalks and is only visible when it rains (or if someone brings along a bottle of water, water balloon, bucket of water, etc.) The paint is environmentally friendly and will last for 2-4 months. 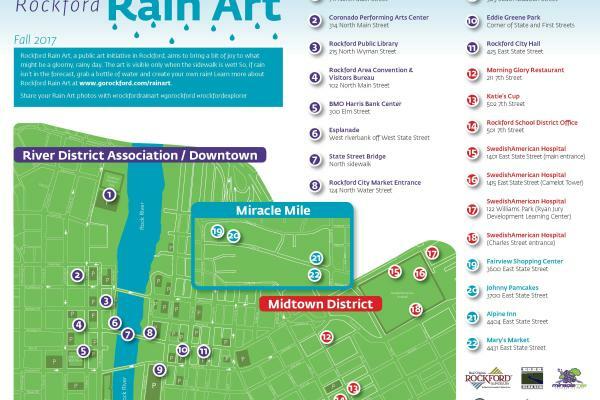 Download a map of the 2017 Rockford Rain Art locations here!